As the greatest bike race in the world is coming to Yorkshire there are all sorts of celebrations and activities happening across our fantastic countryside. One of the largest and most prolific of these events is Velo Fest, a 3 day cycling, camping and music festival right on the course of the Tour de France. It looks superb! The music line up is looking to keep the place lively with Toploader headlining the event. Any cycling fanatic should be there and not missing out on the live shows, trade stalls and activities. 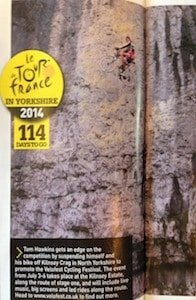 To help promote this event we ran a photo shoot for Cycling Weekly, helping the event organiser Tom and his bike scale the mighty Kilnsey Crag in the Yorkshire Dales. This was no easy feat as it meant our instructor Will had to climb F7a (hard as nails) in the rain to get the ropes in place. This all happened on a finger freezing day in February. We got some cracking shots though and had quite the laugh in the process, check out the photos below. If the idea of cycling off road excites you, why not join us for a ride when the Tour de France takes place? 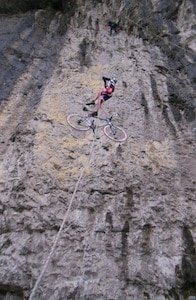 We have some guided mountain bike rides in the Peak District during weekend of the York to Sheffield stage, check out our guided mountain bike rides.